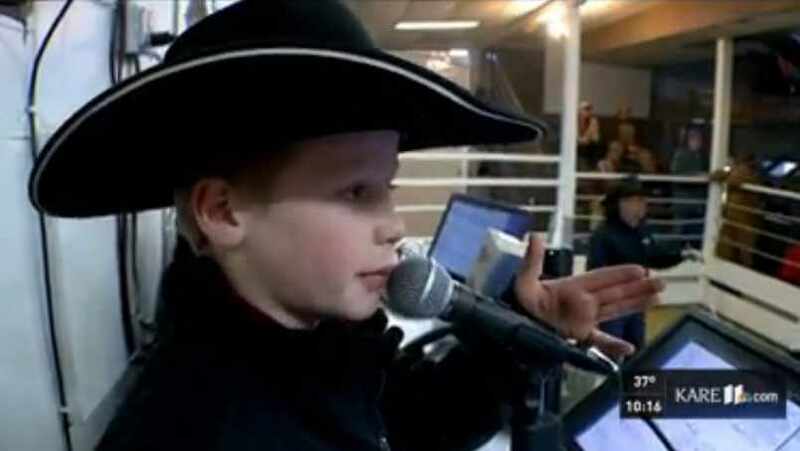 Cash Owen's skills as an auctioneer and his medical story were recently highlighted on KARE-11 TV and in USA Today. By all accounts, and his parents' admission, 10-year-old Cash Owens probably shouldn't be alive today. "Twelve hours after he was born, he started vomiting neon green," Leah Owens, Cash's mom, tells us. "They told us that his intestines did not develop right." At that point, their local health care provider told Leah and Dan Owens, of Truman, Minnesota, to get young Cash to Mayo Clinic … now. At Mayo, doctors determined that Cash would need surgery. The surgery wasn't easy on the newborn. "We lost him 12 times," Leah says. "They kept resuscitating him, and finally, they … hooked him up to the ventilator. Cash and his family stayed at Mayo while doctors waited for his intestines to grow so they could properly join them. "We were at Mayo for quite some time," Leah says. "Cash had three different surgeries." After his initial surgery, Cash needed a double hernia surgery because of all the stress and trauma his body had endured. "My sister worked on the NICU when Cash arrived at Mayo, but of course she couldn't touch him because she was family," Leah says. "But having her there helped us better navigate and understand the terminology that was being used to describe Cash's condition." Leah says her sister wasn't the family's only guiding light during that time of uncertainty. "Cash's entire care team was phenomenal," she says. "Everyone treated us tremendously well. The doctors and the nurses did so well with him and were not only knowledgeable about his condition, but also very sincere in how they treated him. Though it wasn't the best of circumstances, we had a great patient care experience at Mayo, and we're very grateful that Mayo is so close to home for us." In the 10 years since, Cash's circumstances have changed quite a bit, as KARE-11 TV recently reported. In fact, around his hometown, he's a rising star in the world of auctioneering, a skill his dad tells KARE-11 he picked up from a family friend during a (long) drive home from Montana. "For 795 miles home, every fence post and rock and pickup and cow and everything else that they saw got sold," Dan Owens tells the TV station. And Cash's fast-talking is a hit with local cattle buyers at Blue Earth Stockyards, which the family operates. (They have a full-time auctioneer, too.) His parents say he's enjoying every second of it. "I just think he enjoys life more," Dan Owens tells KARE-11. "I think he appreciates it because he was close to not having one." See Cash's story here. Then, steer yourself to the comment section below and share your thoughts. And don't forget to share this story with others using our handy social media tools. I am honored to say that these are very good friends of me and my wife. Every single one of them is amazing, and to see Cash ride and work with his siblings and parents on their ranch is a spectacular sight. I can also say that I was at their house right after their Montana trip and watched Cash and he and his brother sell everything in the living room too!